The Holy Spirit has never left the Church and neither have His supernatural gifts and manifestations. They have been available in every century — from the days of the Apostolic Fathers, to the desert monks of Egypt asnd Syria, to the missionary outreaches of the Middle Ages, to the Reformation era and the awakenings and revivals that followed, to the Pentecostal explosion of the Twentieth Century and the increase of signs and wonders in the Twenty-first. Miracles, healings, deliverances, prophecies, dreams, visions — even raising the dead! — have all been in operation throughout the history of the Church. Anglicans, Baptists, Catholics, Congregationalists, Lutherans, Methodists, Moravians, Presbyterians, Quakers and many others have experienced the supernatural gifts and workings of the Spirit over the centuries. at various times in history. Why the gifts and miracles were more frequently in manifestation in some eras than in others. The many ways the Church has ministered in healing and deliverance. How the Holy Spirit manifested in great revivals. How the river of gifts and miracles continues to flow today. Jeff Doles Miracles and Manifestations is an outstanding collection of original documents which chronicle the "greater works" Jesus promised to his followers throughout church history. Doles unearths a breadth of material, some of which is not well known in the scholarly world. This work is equally useful both to the theologian and to the devotional reader. ~ Jon Ruthven, Professor Emeritus at Regent University School of Divinity. 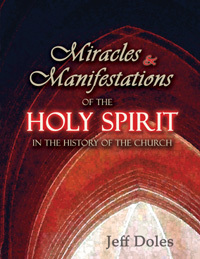 "Miracles and Manifestations of the Holy Spirit in the History of the Church is an excellent resource for any student of the Bible. Jeff Doles has done a masterful job of relating historical facts in a compendium that is actually both easy to read and impacting. He clearly debunks the theory that miracles and manifestations of the Holy Spirit ceased when the apostles died or when the New Testament canon was completed. This book is well worth reading. You will be amazed at how much was going on in the church, even during what we call the “Dark Ages.” You may also be surprised at the number of supernatural events that occurred during the ministry of Reformers and Revivalists since those dark ages. "As I discovered in my research for my own book, Signs and Wonders – To Seek or Not to Seek, God’s primary method of making believers out of unbelievers is the supernatural activity of the Holy Spirit. Jeff Doles’ book will help every believer to accept the renewal of the miraculous in our own day. My strong advice for every Christian is to get and read this book." JEFF DOLES is a Christian writer and Bible teacher. His books include The Kingdom of Heaven on Earth: Keys to the Kingdom of God in the Gospel of Matthew, Praying With Fire: Change Your World with the Powerful Prayers of the Apostles and Miracles and Manifestations of the Holy Spirit in the History of the Church. He and his wife Suzanne live near Tampa, FL.